The Qualcomm Adreno 530 is an integrated graphics card for (mostly Android based) smartphones and tablets. It was introduced in the last quarter of 2015 and is integrated in the Qualcomm Snapdragon 820 SoC. It supports OpenGL ES 3.1 and DirectX 11.1. The GPU uses a still unknown amount of unified shaders clocked at up to 624 MHz. In 2015 it belongs to the fastest GPU for smartphones. 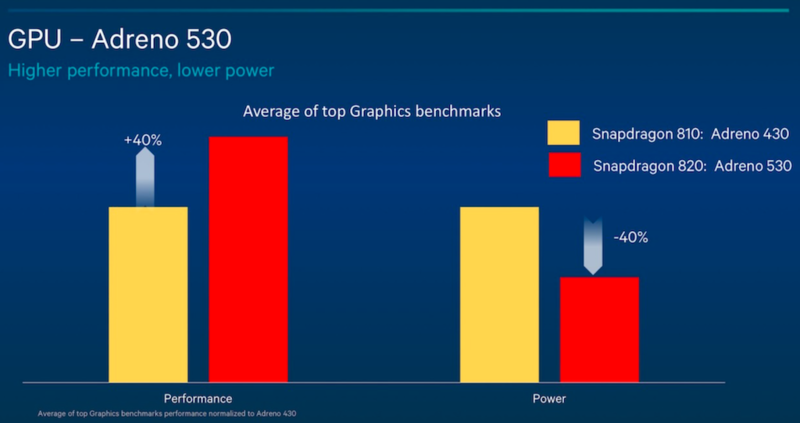 Compared to the predecessor Adreno 430, the 530 is especially faster in demanding benchmarks. Qualcomm Snapdragon 820 MDP: Qualcomm Snapdragon 820 MSM8996, 6.2"